Rubies have a hardness of 9.0 on the Mohs scale of mineral hardness. Among the natural gems only moissanite and diamond are harder, with diamond having a Mohs hardness of 10.0 and moissanite falling somewhere in between corundum (ruby) and diamond in hardness. 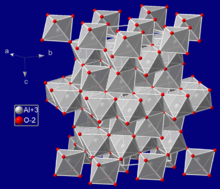 Sapphire, ruby, and pure corundum are α-alumina, the most stable form of Al2O3, in which 3 electrons leave each aluminium ion to join the regular octahedral group of six nearby O2− ions; in pure corundum this leaves all of the aluminium ions with a very stable configuration of no unpaired electrons or unfilled energy levels, and the crystal is perfectly colorless. Crystal structure of ruby showing the substitution of Al3+ ions (blue) with Cr3+ (red). The substitution density of Cr3+ ions in this model is approximately 2%, approximating the maximum doping normally encountered. When a chromium atom replaces an occasional aluminium atom, it too loses 3 electrons to become a chromium3+ ion to maintain the charge balance of the Al2O3 crystal. However, the Cr3+ ions are larger and have electron orbitals in different directions than aluminium. The octahedral arrangement of the O2− ions is distorted, and the energy levels of the different orbitals of those Cr3+ ions are slightly altered because of the directions to the O2− ions. 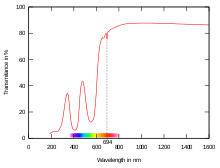 Those energy differences correspond to absorption in the ultraviolet, violet, and yellow-green regions of the spectrum. If one percent of the aluminium ions are replaced by chromium in ruby, the yellow-green absorption results in a red color for the gem. Additionally, absorption at any of the above wavelengths stimulates fluorescent emission of 694-nanometer-wavelength red light, which adds to its red color and perceived luster.